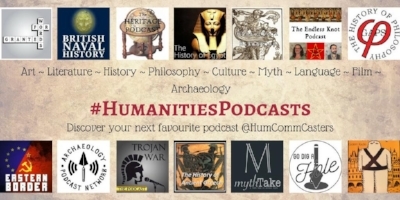 #HumanitiesPodcasts is an informal community network of humanities-related informative & educational podcasters; you can find more information @HumCommCasters on Twitter and Humanities Podcasts on FaceBook. femsoc podcast @femsocpodcast We are the Westminster Feminist Society podcast . We talk about various feminist topics and we are intersectional feminist.Subscribe to our podcast. The Story Behind @StoryBehindPod The extraordinary #history of the ordinary. If you like #trivia and fun facts, subscribe on your favorite #podcast app. Daniel @latinitium Latin podcast, blog and videos. AncientGreecePodcast @greecepodcast Ancient Greece Declassified is a monthly podcast that transports you to the ancient world and back, with some good conversation along the way. Idiom Savant @idiomshow The podcast that attempts to explore and explain the origins of common expressions in a manner that isn’t nearly as boring as this description. Witch Hunt Podcast @WitchHuntpod Who can we blame? Subscribe to the Witch Hunt Podcast, a biweekly show that examines famous witch hunts - literal and metaphorical. Human Circus Podcast @circus_human A podcast of varied historical delights. Great stories told bi-weekly, give or take. M. C. Williams @HardcoreMyth Telling the stories that shaped cultures around the world in all their brutal, bloody glory. ThePast & TheCurious @pastandcurious History podcast for young and old alike. Like great stories and cool music? of course you do! You're hip! The Feast @Feast_Podcast Meals that made history. Sporadic recipes. Patchy puns. Hosted by @lauramcarlson Available on iTunes. The Lonely Palette @lonelypalette The podcast that returns art history to the masses, one painting at a time. Subscribe on iTunes et al. Hosted by @tamsavvy. literatureandhistory @lahpodcast This podcast is an introduction to Anglophone literature, from ancient times to the present, done by a Ph.D. with lots of books and musical instruments. Trojan War Podcast @TrojanWarPod Trojan War:The Podcast tells history's greatest epic as a serialized story. The storytelling (clever, witty, entertaining and informed) blends history and myth. Racist Sandwich 🍔 @raceandfood The podcast about food, race, class, and gender. Hosted by chef @hooleil and journalist @zahirj. Produced by @alanmontecillo. Write Now Podcast @WriteNowPodcast A weekly podcast for writers -- published, wannabe, or anywhere in between. Hosted, edited, & produced by @SarahRheaWerner. I like you. TheEasternBorder @Eastern_Border A podcast, explaining the life in and the history of USSR, from the perspective of the people who actually lived there. Spirits Podcast @SpiritsPodcast Spirits: A Drunken Dive into Myths and Legends is a boozy biweekly podcast hosted by @shessomickey & @JuliaSchifini and edited by @ImEricSchneider. The Academic Podcast @AcademicPodcast We are a new podcasting project from @Canadian_Errant and @Farhanistan. We talk about lots of fun academic subjects. TheAcademicPodcast@gmail.com. Keep Watch! The Endless Knot @AllEndlessKnot The Endless Knot YouTube series and podcast about etymology, language, literature, history, science, and the connections in the world around us. Museum Archipelago @museum_go Museum Archipelago is your audio guide through the landscape of museums. New episodes every other Monday. Alison Innes @InnesAlison #HumComm (#humanities communication), higher ed, classics, mythology, gender theory, digital humanities, sketchnotes. Co-hosting #MythTake. Tweets own. #BrockU. Talking Tolkien @TalkingTolkien The weekly podcast where three friends discuss the works of J. R. R. Tolkien chapter by chapter. Hosted by @thekatenik @jonvox & @ChaseS19. Partial Historians @p_historians After surviving being exposed at birth, these unconventional academics realised they were destined to establish the greatest podcast empire ever! The Allusionist @AllusionistShow Small adventures in language with @helenzaltzman. This podcast is a proud member of @radiotopia from @prx. ArchPod Network @ArchPodNet Bringing informative, professional, archaeology podcasts straight to your ears. Medieval Death Trip @mdtpodcast A podcast exploring the wit and weirdness of medieval texts. WET Podcast @wetpodcast @emarsh interviews interesting people in Writing, Education and/or Technology. Professor Buzzkill @buzzkillprof Professor Buzzkill is an exciting #blog & #podcast that explores #history #myths in an illuminating, entertaining, and humorous way. Talk the Talk @talkrtr A weekly exploration of the science of language with Daniel Midgley, Ben Ainslie, and Kylie Sturgess on RTRFM 92.1. If I @-ed you, we talked about your work. Gastropod @Gastropodcast Award-winning podcast co-hosted by @cagraber & @nicolatwilley. Food with a side of science and history. TTR-Morgan Z. Sowell @TheTableRound The Table Round is an audio drama adaption of the legends of King Arthur. The writer sometimes rambles. Footnoting History @HistoryFootnote Where historians pluck stories from the past and serve them to you one podcast at a time. Tweets by Christine. Kevin Stroud @englishhistpod Kevin Stroud presents the History of English Podcast for word lovers and history buffs. 365Philosophy @365Philosophy Thinking every day - 365 podcasts every day for 2017. Support to get bonus content at http://www.patreon.com/kyliesturgess . Alexander Veronensis @Alexander_Ver Pipio Latine, plerumque de nugis. Incido podcast Latinum dum raedam moderor. Peter Adamson @HistPhilosophy Professor of Philosophy at the LMU in Munich; hosts podcast about the History of Philosophy... without any gaps. Liz Covart @lizcovart Historian, Knowledge Seeker, Tireless Poser of Questions. Host of Ben Franklin’s World: A Podcast About Early American History. Mint Chip Epicure. Red Sox Fan. Laszlo Montgomery @LaszloCHP Creator and humble narrator of the China History Podcast, Chinese Sayings Podcast & The China Vintage Hour bringing you podcasts about Chinese cultural topics. (((Kim Biddulph))) @kimbiddulph Writer, educator, podcaster, @SchPrehistory@chilternoam @HamiltonTrust @archpodnet. Reviewer @EXARC_net. Museums, archaeology, science, education, swords. Jamie Redfern @HistoryJamie 23. Historian, podcaster on America, ancient Rome, Alexander the Great and the Arab Spring. Medieval Archives @MedievalArchive Illuminating the Dark Ages for the Digital World. Podcast and website dedicated to the medieval era. Missed In History @MissedinHistory Holly and Tracy splash around in the depths of history. Robin Pierson @byzantiumcast The man behind The History of Byzantium podcast and http://thetvcritic.org website. Vivek Vasan @histoindicast A podcast history of India and South Asia. Matt Smith @nightlightguy Podcaster and sometime freelance journalist. A muppet of a man. Podcasts: Emperors of Rome, When in Rome, Asia Rising, Biography. Carthago delenda est. A Way with Words @wayword Public radio's bouncy house of language! words@waywordradio.org, 877-929-9673, http://waywordradio.org . Also follow @grantbarrett and @marthabarnette. Mike DuncanVerified account @mikeduncan History Podcaster | Revolutions | The History of Rome | Just handed in the manuscript for a book on the beginning of the end of the Roman Republic. Dan LeFebvre @danlefeb Host of the Based on a True Story podcast. Formerly at Digital-Tutors.